Minor maintenance at 15 000, 45 000, 75 000, 105 000 miles etc. / 24 000, 72 000, 120 000, 168 000 km etc. 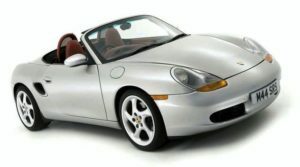 – Check inner release of front luggage compartment on 2002-on vehicles (‘03-on Boxster). Major maintenance at 30 000, 60 000, 90 000, 120 000 miles etc. / 48 000, 96 000, 144 000, 192 000 km etc. ParkAssist, automatic speed control, TC/PSM switches, heater, air-conditioning system & instruments. This entry was posted in 986 (1996 - 2004), Porsche Maintenance Plans. Bookmark the permalink.